Make this custard merely because it is downright delicious — creamy, decadent, with a hint of spice and subtle sweetness, but if you should need to know, it is also gluten-free, grain-free, dairy-free and can be made without processed sugar. We use leftover mashed or baked sweet potatoes to whip up this one-bowl wonder. Your food processor or immersion blender combines everything to the perfect consistency in just a few minutes. All you have to do is wait (and fight off the aroma of maple and spices) while it sets to satin flawlessness in the oven. 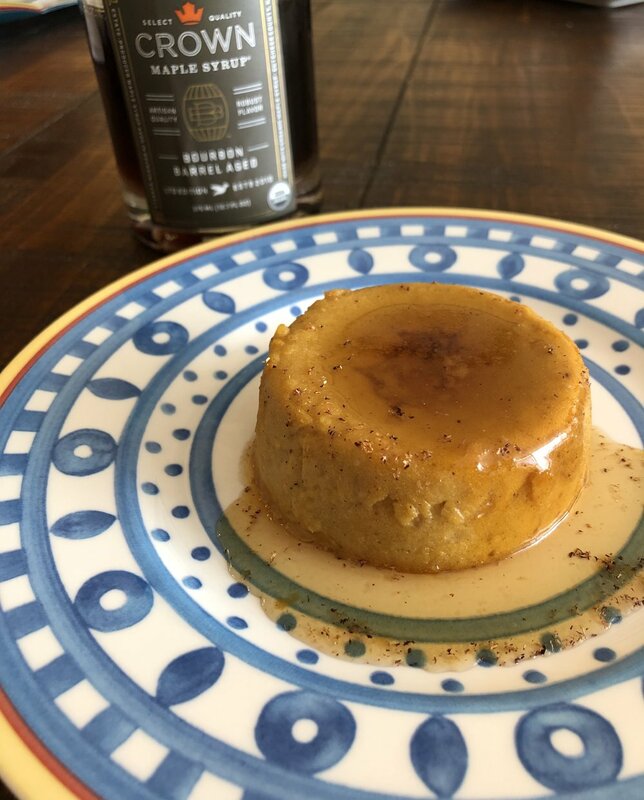 You can also adjust the level of sweetness — reduce the maple crystals and serve with additional maple syrup on top. We sometimes swap the sweet potato for cooked pumpkin or winter squash flesh. We eat this for breakfast, brunch or dessert (and 2-year-old Andy consumes multiple servings as a meal at least once weekly). Whip everything up in a food processor, blender or with an immersion blender. Since there is no gluten, it’s hard to overdo it. The blending will simply make it all smoother. But if you create a lot of bubbles in the process, tap those out once you fill your ramekins. A water bath or bain marie is a good idea if not a necessity (and not a particularly difficult one) for cooking custard to satiny smoothness. Don’t skip this. Before starting, simply find a baking dish large enough to hold your ramekins with space for some hot water in between. 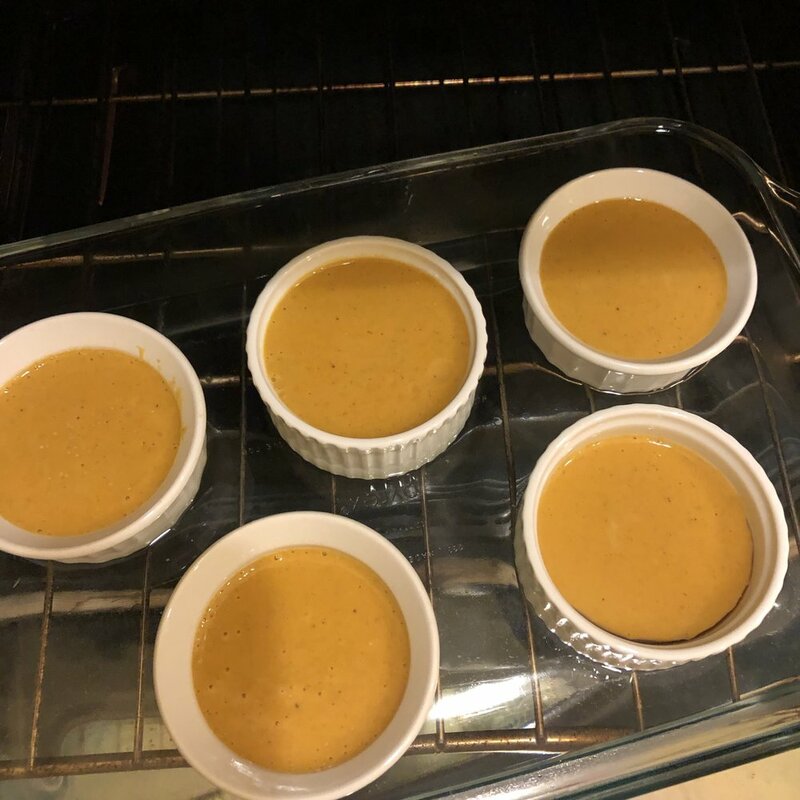 But don’t add the hot water until you've put your baking dish with filled ramekins into the oven and handle carefully to prevent water from spilling into the custard. Maple crystals are the result of boiling all of the water off of the sap harvested from maple trees. 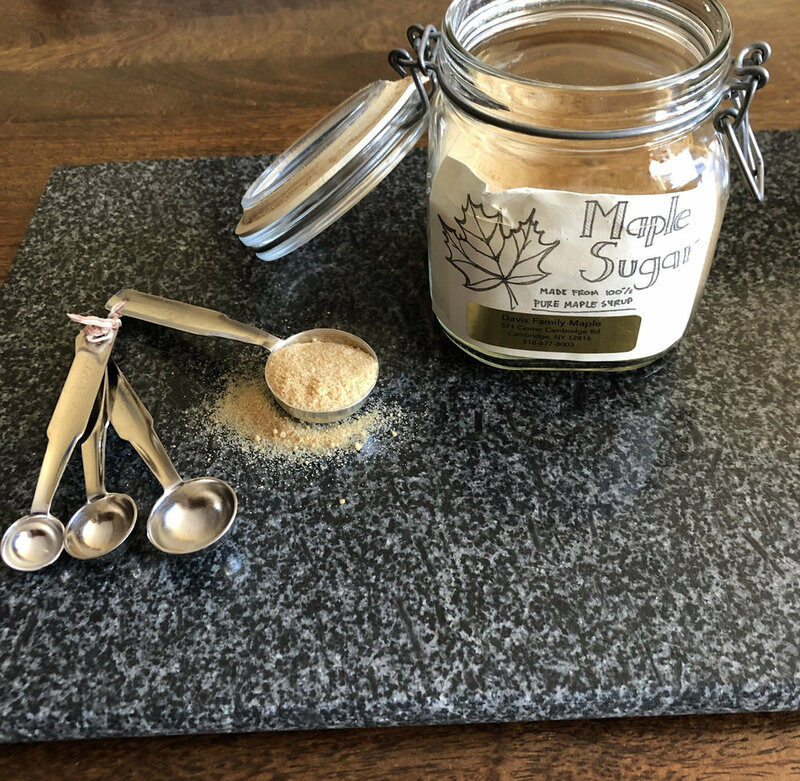 Maple crystals, also known as maple sugar, are becoming increasingly easier to find wherever you buy pure maple syrup. If you can’t find maple crystals, turbinado and coconut sugar are your next best options in this recipe. 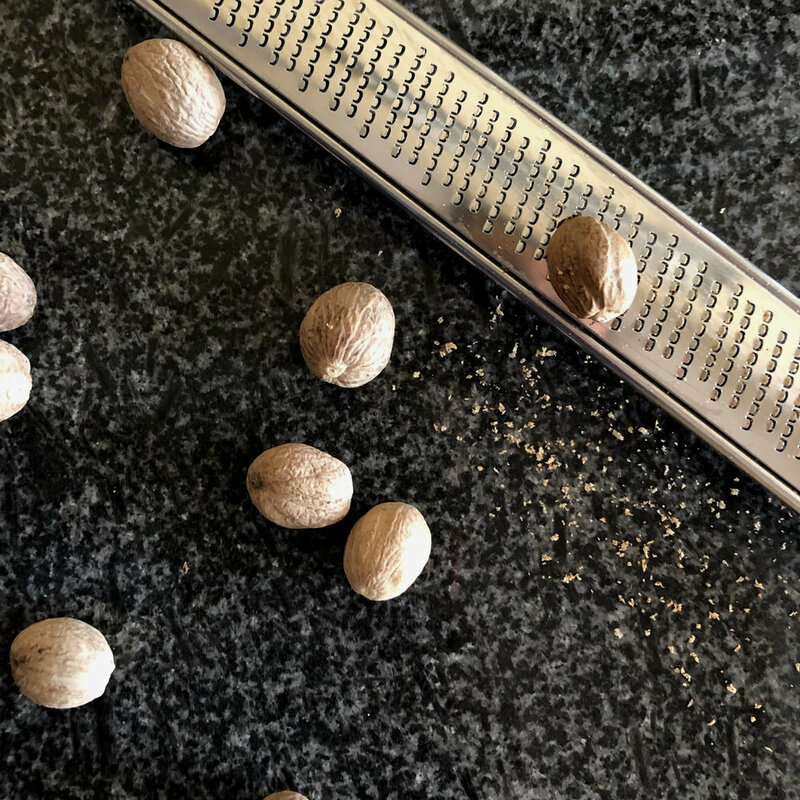 Freshly grate your nutmeg — it makes all the difference. The custard is set when it no longer jiggles, except for a circle the size of a pinky fingertip in the middle. Optional: With a knife, loosen edges of custard and invert ramekin onto a plate. Serve with additional maple syrup and a dusting of freshly grated nutmeg. Preheat oven to 350 degrees. Brush 8-10 ramekins with coconut oil and place in a large baking dish with high sides. In a food processor or with an immersion blender in a medium bowl, purée sweet potato flesh with cinnamon, nutmeg, cardamom, ginger, cloves and sea salt until smooth. Stop and scrape down sides. Add maple crystals, maple syrup, and remaining melted coconut oil. Purée until smooth. Stop and scrape down sides. Add eggs and process until creamy, about 2 minutes. Add coconut milk and tapioca starch and process until smooth. Pour into prepared ramekins. Carefully transfer to oven rack that is slightly pulled out. Pour hot water into the baking dish until it comes halfway to two-thirds up the sides of the ramekins. Carefully slide the baking dish and oven rack back into the oven. Bake 25-30 minutes until custard is set. A tiny pea-sized circle in center will jiggle just a little when done. Allow to cool in baking dish 5 minutes. Then remove ramekins from baking dish and allow to cool further. Serve warm or chilled with additional maple syrup or dusting of freshly ground nutmeg if desired. To Freeze: You can freeze the unbaked custard mixture two ways: pour unbaked custard mixture into a freezer safe container or wrap filled ramekins tightly in plastic wrap. Freeze up to 3 months. Defrost in refrigerator about 3 hours and continue with procedure. Alternatively, keep completely cooled baked custards in their ramekins and wrap tightly with plastic wrap. Freeze up to 3 months. Defrost in refrigerator about 3-4 hours and enjoy or allow to come to room temperature before enjoying.